Since then I have had many more attempts at carving spoons, not all of them successful. I have been frustrated by the odd one splitting or not turning out quite as good as I had first envisaged. I have been inspired by watching and learning from my more experienced Woodlore colleagues who are always on hand to give guidance and constructive feedback (and, to be truthful, I have felt the occasional pang of jealousy from the apparent ease and skill they demonstrate in carving beautiful things). I realise that, like me, they too have embarked on a journey; one which no doubt has had the odd carving setback along the way, but, despite this, they have chosen to persist and improve in this skill. I too am going to endeavour to do this and am looking forward to expanding my knowledge and skill further by attending future Woodlore courses. Both the Camp Craft course and the Carving Master Class with Ray offer fantastic opportunities to learn more about working with wood. This simple act of carving or cutting something tangible out of wood to me represents all which I love about Bushcraft. It requires patience, mindfulness, knowledge and skill. There are no shortcuts, no one else can do it for you, and if you persevere you will be rewarded. 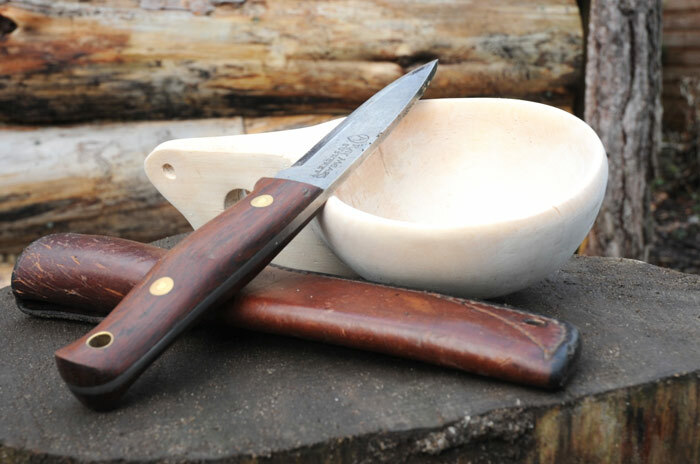 Carving may well be my biggest challenge in Bushcraft; navigation, tracking or fire lighting may be yours, but the more challenging the journey the more rewarding it can ultimately be.